The specific construction, amber/white button illumination and customized styling of the front panel make ZENEC’s naviceiver blend in perfectly with the Mercedes Sprinter II, Vito, Viano, A-Class, and B-Class. The ZE-NC4612 is a smart specialist, specifically developed for various Mercedes vehicles. The specific construction, amber/white button illumination and customized styling of the front panel make ZENEC’s naviceiver blend in perfectly with the Mercedes Sprinter II, Vito, Viano, A-Class, and B-Class. The ZE-NC4612 is also effortlessly integrated into the existing automotive electronics. The E>GO is linked to the steering wheel remote control and the Multifunction driver information display via the vehicle-specific CAN bus interface. ZENEC’s Mercedes specialist offers you Europe-wide navigation that is precise, fast and reliable. The ZE-NC4612 comes with TMC, a Premium POI database, 3D city/landscape views and Latest Map Guarantee. Thanks to the special navigation software, which incorporates the state of the route and vehicle parameters in the guidance, you are always driving on a route that is suitable for your vehicle. Travel relaxed throughout Europe and enjoy the sophisticated ZENEC multimedia features with CD, DVD, USB, SD, und Windows/Android smartphones or iPod/iPhone. The integrated hands-free system allows you to make telephone calls in comfort at any time. You can go for any double din Satnav system. See the link below. You will need the below listed parts for installation. 55 plate Mercedes c220 cdi elegance, no preinstalled Bluetooth connector. want to install sat nav and Bluetooth connection. 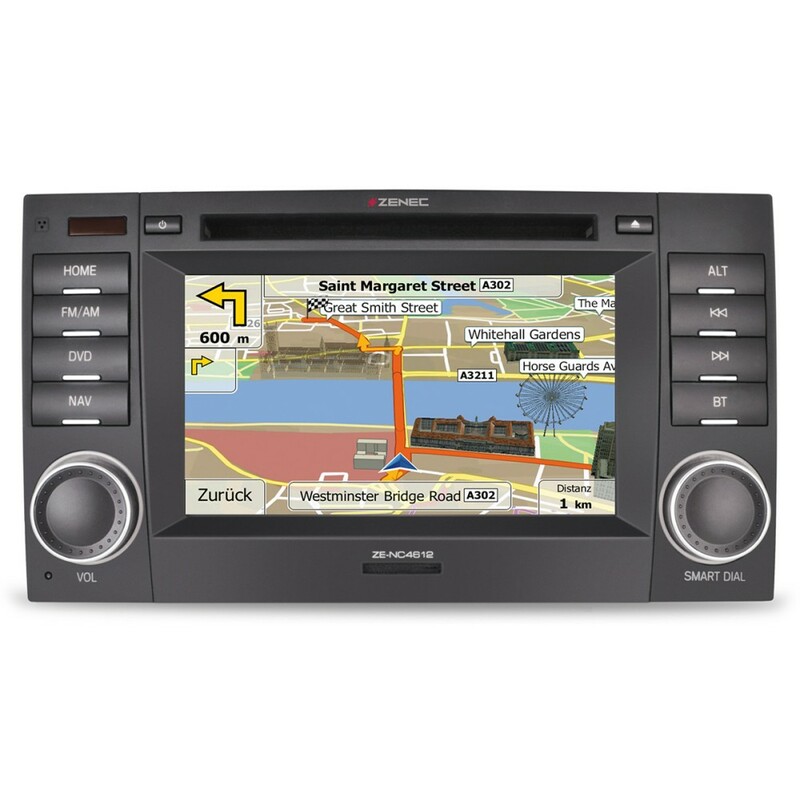 You can go for the following double din Sat Nav system. All parts required for installation are also listed below. Looking for replacement system for my Mercedes-Benz CL 600 2001 w215 model. Car currently has original COMMAND unit installed with separate amp & CD changer. Hi yes we can replace your system but is is a complicated job. It requires a full re wire of your system including bypassing your existing amplifier system and re wiring all speakers. Your existing cd stacker will not function. A kenwood ddx-4016dab would be a good choice of replacement unit. Please visit your local store to discuss this in detail as it is a complicated job that requires inspection of the vehicle. 2007 Viano (W639) 2.2 cdi fitted with a radio sound 20, and steering wheel buttons. Can the Zenec ZE-NC4612 replace this? and what is required? Hi yes the ZE-NC4612 will fit your Viano and should be a direct replacement for the Audio 20 unit. Do you have a replacement head unit to fit and work in a 2004 Mercedes SL500 (R230) with Bose installed?